Hi Fresh Squeezed fans! 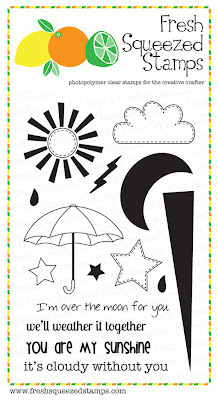 Sharing a card for baby using two fun Fresh Squeezed Stamps sets! I created a trail of stars from Weather Through that I coloured with pastel coloured Copics and then outlined each star with a clear glitter pen. For my sentiment I embossed a portion of the baby Subway Series: Occasions stamp and heat embossed it in white. 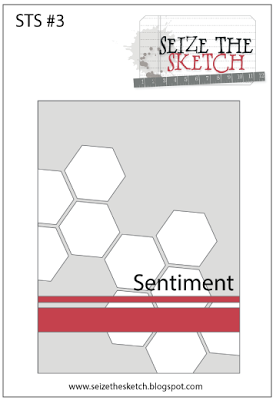 I use the sketch from Seize The Sketch for my card this week. This is a really cute take on the sketch...love those stars in place of the hexagons. Cute, cute, cute baby card! Fabulous use of the sketch and love the pastels. Perfect selective stamping and I love the shower of sweet stars! Fabulous! 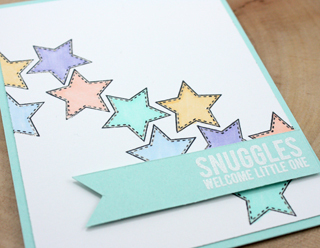 Love the pastel colours and the stars are adorable! 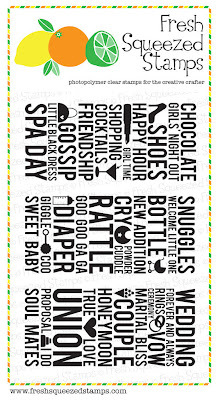 Love this baby card! I never thought to use part of the stamp for the sentiment. Thanks for the inspiration! Beautifully done. A perfect birthday card. And, I had completely forgotten about Seize the Sketch--so thanks for that heads up. Great use of the sketch!! Sweet card!! this card knocks my socks off, I just love it! Those stitched stars are so perfect for a baby card!